• Dinner for the couple in the romantic Poiano Restaurant (drinks not included). 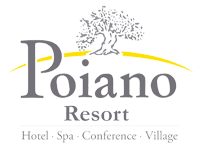 • 1 entrance of 3 hours, by appointment, to Poiano La Spa Wellness Path (salt water lagoon, sauna, hammam, emotional showers). • 1 Sweet lesson of 60 minutes for the couple. • 30% discount on additional treatments and massages. Package price: from € 97 per person.